There is only so much 'Getting Started w/ Yoga' advice someone who is only 3 months in can give. This is all of that advice + a yoga playlist. Over the last few months, I’ve been taking some time to pull back and concentrate on something I often forget is there: myself (cut to scene where Oprah reaches out, grabs my hand and looks proudly into my eyes). Now, I would like to say that getting intently into introspection has helped me figure a bunch of important stuff out, but that would probably be a stretch. Speaking of stretches, I recently started getting into a daily yoga routine. And since I am a total newbie and can barely hold any proper poses, I’ve found it really helpful to just embrace the fact that I am a total newbie that can barely hold any of the proper poses. Because once you let yourself be ok with not being currently awesome at something you plan on slowly trying to get better at, that thing—and the process of fractionally improving each day—becomes a whole lot more enjoyable and doable. I am currently applying this theory to yoga and tentatively calling my approach DO YOU ¿ YOGA—as in “you gotta just do you”, but also as in “do you?”. Except, instead of a question mark (? ), I've used the upside-down-Spanish-style-one (¿)—because that way "DO YOU ¿ YOGA" is kinda like a question but also not + the upside-down question mark kinda looks like someone doing a kneeling pose. Don't worry, the way this made up yoga "program" actually works is much simpler than the explanation behind its name. •STEP 1 - Put on some nice tunes. To help, I’ve started a Spotify playlist that consists of 54 tracks you can throw on shuffle and get a chilled yoga vibe going as you move from "Downward Dog" to that thing that I'm assuming is called "Upward Dog". PS - I have also found that putting on an Audiobook or Podcast sometimes instead of the music is a good way to mix things up + fit in some extra learning with your stretching. •STEP 2 - Lay out your mat (light a candle if you're a romantic or hit a vape pen if you're a skeptic) and using whatever level of yoga knowledge you currently have, get in the flow of whatever routine feels right with the music and your body. Y'know, "do you". Depending on the day's busyness, I flow for 15-40 minutes every morning. And it's one of my favourite 15-40 minute stretches of every day. If you don’t have any yoga knowledge at the start, that's ok. I didn't either (also, that is literally how starting something new starts). Just jump over to youtube and watch a few videos. I’ve found Yoga With Adrienne to be a very good one as she is pretty chill and has a very good "do you" mentality. Plus, she has Shakey Graves on her intro song, so what more of a co-sign can you ask for? The key here (in regards to DO YOU ¿ YOGA at least) is to mostly use these instructional videos to learn a few things that you can take back into creating your own routine without the videos. Maybe it's just me, but I found that when I was following along with the instructional videos, I’d end up spending a lot of my awareness cranking my neck trying to follow along with what's happening on the screen, thinking thoughts like, “it sure doesn’t look like that when I do it”. And that didn't always feel super zen. Of course, it's important to learn new techniques and how to do things properly—but it’s equally important to just experience closing your eyes and connecting to the movements of the moments that feel right for you. 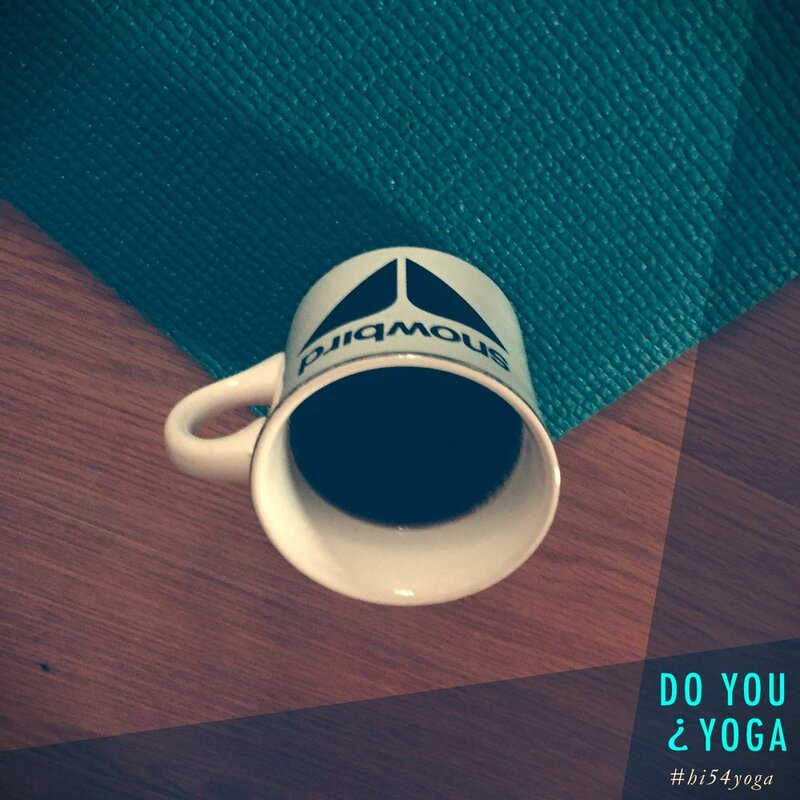 Because those are the places where you'll realize "ooohhh… so that's yoga". And the earlier you can get to that realization, the more likely you'll be to starting and keeping up a regular habit. And that's when the magic powers come in to play (I'm assuming; I have not made it to the magic powers level yet, but I've watched some Youtube videos that suggest yoga is a lot more than just stretching out your body). Anyways, best get back to my stretching with the devil. Namaste / nah I'mma stay.